Join us in Beaumont for our quarterly “no-host”, pay your own way, lunch. Bring a friend. Bring another Alumni, parent or even another service academy Alumni. Meet your fellow Beaumont USNA Alumni. June 11, 11:30am @ New York Pizza & Pasta (Downtown) 790 Neches St.
RSVP for headcount to John Augusto m020234@2002.usna.com. This event is exclusive to TxGC members and their guests. Link to purchase tickets requires a code and was made available via member-only newsletter. If you’re a TxGC member, and did not receive the email with code, please contact Rick Bush at the email listed. TxGC Chapter is proud to announce two outstanding speakers for our May and June monthly lunches. May 3 Speaker: Jim Olson, Professor of Practice at Texas A&M Bush School to speak on his experience on intelligence, counterintelligence, and international crisis management. June 7 Speaker: Ric Stoll, Albert Thomas Professor of Political Science, Rice University to speak on international conflict, public attitudes on foreign and defense policy, and American national security policy. TxGC MEMBERS ALWAYS GET $5 OFF! Saturday March 2nd the Texas Gulf Coast Foundation Sponsored the Southeast Texas Regional SeaPerch Competition. 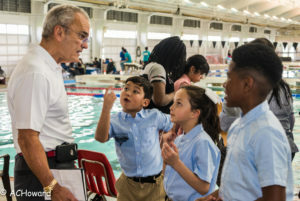 As the sole outside sponsor the foundation was able to provide $10,000 for kits and tool bags delivered to 37 teams to participate in the underwater drone competition. With over 52 teams competing including elementary, middle, and high schools this is the largest underwater drone competition in the area. The competition required the teams to compete in an underwater obstacle course, underwater skill challenge, speed assembly race, and an interview. The three best individual performances were awarded with full scholarships to the USNA Summer STEM program. Captain Chris Cassidy (’93) provided the keynote speech relating his experiences as a SEAL and Astronaut to the challenges the teams faced during the competition. He even surprised the winning team with a unique gift – Russian space food! Chris Black (’07) led the effort as part of the Texas Gulf Coast Chapter and Foundation’s objective to improve outreach and knowledge of USNA through promotion of STEM activities. The event was a rousing success as over 50 teams and 200 students competed and learned about the world of opportunities USNA provides. The foundation has approved funding and growing this competition for the next four years. More photos from this event. Consider donating to the TxGC Foundation. Your donation goes to programs just like this one and other programs we support here in the Houston area that directly support USNA Admissions and their recruiting efforts. While public funding makes the Naval Academy good, it’s private philanthropy that makes the Naval Academy great. As your TxGC, Alumni Association, Trustee, this past November, I was fortunate enough to attend the public phase launch of the Naval Academy Campaign (aka Called to Serve, Daring to Lead). There is so much that I did, and did not understand, even after being a Midshipman (not so long ago) and serving in active duty, back at USNA. Although it is taxpayer dollars that help support the core mission of USNA, it is not enough to ensure USNA truly competes at the highest levels with America’s best universities, in addition to other service academies. The “Called to Serve, Daring to Lead” fundraising campaign has raised $393 million to date, so it is expected that the total money raised will exceed the goal of $400 million. The needs of the Naval Academy Athletic Association and the Cyber Operations program have been met, but there are some programs such as the Admissions Excellence program that need financial support. Supporting USNA Directly (1), or through our TxGC Foundation (2) achieve the mission. Called to Serve, Daring to Lead: Donate directly to the Naval Academy Campaign. The goal is $400 Million, but $373 $393 Million has already been raise thanks to some very generous Alumni. So help USNA exceed the push for the remaining $23 $7 Million. 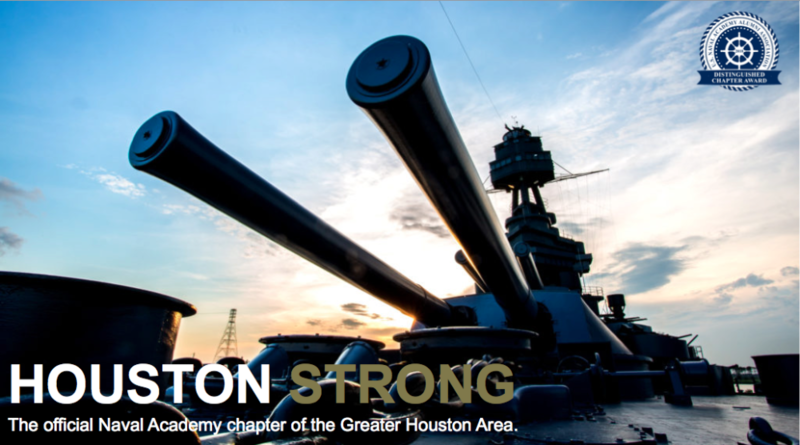 Donate to our TxGC Foundation (Houston): Maybe you just want to support USNA, but in an impactful way, here in Houston? Then support our [TxGC] Foundation. 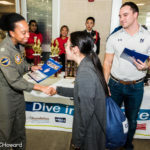 We directly support the mission of USNA and Admissions Excellence by giving scholarships for local candidates (in need) attending USNA Summer Seminar and Summer STEM, and assisting USNA Admissions by helping fund STEM programs at Houston area middle schools, sparking interest and awareness of USNA. A great example is our Foundation’s support of Fort Bend ISD Robotics Competition this past March 2019! In either scenario, know that your money will go to good use, helping ensure the future success and excellence of the Naval Academy. Thank you for making me your TxGC representative on the Board of Trustees. As your Trustee, I sit on the Alumni Association’s Admissions Committee, and am the Vice Chair of the Member Services Committee, and attend committee meetings in May and December, in Annapolis. Please feel free to reach out to me with your ideas, questions, or concerns. Commander David Edgerton, USNA ’98 Naval Submarine League’s RADM Jack M. Darby Award has been awarded the for inspirational leadership and excellence of command. The Naval Submarine League awards one officer from the Submarine Force, annually, based on outside nomination. The award is presented at the White House in Washington, DC. Commander Edgerton, hails from Houston, graduating from Cypress-Creek High School (Cypress-Fairbanks ISD) in 1994. In 2015, he was selected as a distinguished graduate for Cy-Creek, and added to the Cy-Creek Wall of Honor which recognizes outstanding lifetime achievements and significant contributions made by former students. He received his appointment to the US Naval Academy from Senator Phil Gramm. His Blue & Gold Officer was Paul Marshall ’65. He graduated from the US Naval Academy in 1998, service selecting Submarines. He is currently the Operations Director at US 7th FLEET, in Yokosuka, Japan. He is formerly, the Commanding Officer of USS COLUMBIA (SSN 771). In 1998, David was awarded the Michael Smith ’67 (now the Smith-McCool) Sword, from the USNA Alumni Association, Texas Gulf Coast Chapter, for having the highest order of merit, for Midshipmen from the Houston area, his graduation year. Congratulations and thank you to all of our TxGC Alumni. Because of you and your participation, we’ve won the 2018 Distinguished Chapter Award, for the Central Region. 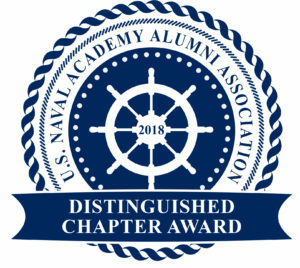 The award is given by the US Naval Academy Alumni Association to the top Alumni Chapter for each region. The award is given to the top Chapter based on a variety of categories, including number of dues-paying members, Alumni and Board participation, number and variety of events, and community outreach. Over the past several years the TxGC Board has worked hard to create value to our Alumni members in the form of more events and benefits, as well as increasing how the Chapter gives back to our local Veteran community, as well as back to the Naval Academy. Through the formation of the TxGC Foundation, a 501c3 non-profit, we have stepped up our philanthropy and partnerships in our area, with the intent to give back. Thank you again to all of our TxGC Alumni. Without you, we would not have been able to be awarded.